The Forum continues to explore ways of providing an easy-to-understand picture of timely and relevant data related to older adults. The infographic is a perfect deliverable format for this effort. Other infographics will be developed around indicators covered in the Older Americans Chartbook. Some topics will be presented in installations and prepared by representative agencies as a Forum collaboration. The U.S. population is aging. To better understand the increase in the size and proportion of the older population in our society, it is important to know why the population is aging and what we can anticipate in the future. 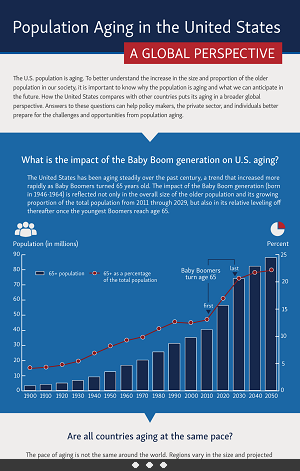 How the United States compares with other countries puts its aging in a broader global perspective. Answers to these questions can help policy makers, the private sector, and individuals better prepare for the challenges and opportunities from population aging.